Discover a sandwich that's anything but boring with this super flavorful BBQ Steak and Peppers Sandwich. 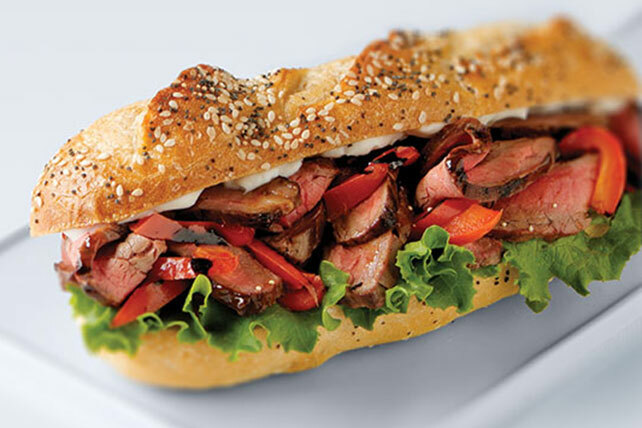 Red peppers, tangy BBQ sauce, mayo and lettuce are all you need to dress up this BBQ Steak and Peppers Sandwich! Grill steak 8 to 10 min. on each side or until medium doneness (160ºF) and grill peppers 2 to 3 min. on each side or until crisp-tender, brushing both with barbecue sauce for the last few minutes. Thinly slice steak and peppers. Spread baguettes with mayo. Fill with lettuce, steak and peppers. Substitute a green or yellow pepper for the red pepper. Add grilled onions to sandwich filling. Just cut 1 onion into 1/2-inch-thick slices and grill along with the steak and peppers. Prepare with KRAFT Light Mayo Reduced Fat Mayonnaise.